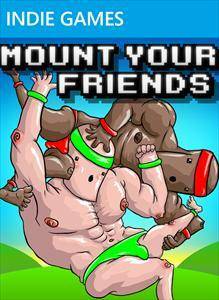 Mount Your Friends, a physics-based competitive climbing game where the climbing is over each other, has competitors switching off climbing to the apex of a enormous mound of previous climbers’ bodies (and a goat) in order to reach a new record height before the clock runs out. Players are eliminated if time runs out before reaching the top. Particularly adept competitors discover how to erect massive towers by flinging themselves upward — a method much faster than a simple climbing strategy. This entry was posted in 2010s, Games by Decade, Queer Game/Narrative on July 3, 2018 by Adrienne Shaw.